1. Try to spot your favorite celebrities on Rodeo Drive and at restaurants around the Golden Triangle - an area ripe for star sightings. 2. 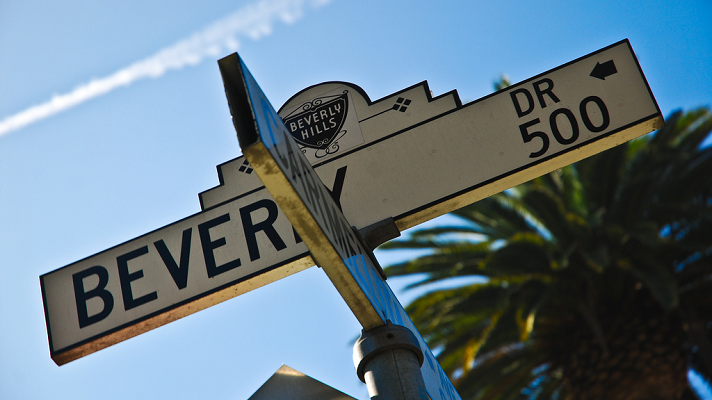 Capture a perfect souvenir by snapping a picture in front of the famed Beverly Hills sign in Beverly Gardens Park. 3. Head into the Beverly Wilshire, A Four Seasons Hotel, to admire the beautiful lobby floral display and get a peek inside this famous hotel where Pretty Woman was set. 4. Take in the sunshine and sounds of the courtyard's babbling fountain as you relax, on the grass or at café tables, in Beverly Canon Gardens. 5. Head up to Greystone Mansion & Park, a legendary estate built by the Doheny family, which is now a park open to the public. Can you find the koi and turtles on the grounds? 6. Groove to the sounds of live music - from Motown to jazz - in Beverly Canon Gardens during the summertime Concerts on Canon series, held on select Thursday evenings. 7. See the world's first 24-hour Cupcake ATM at Sprinkles Cupcakes. Though it's viewable without out making a purchase, it's worth every dollar to try Sprinkles' signature red velvet treats. 8. Walk through the residential areas surrounding the Golden Triangle and see if you can identify the trees planted on each block. From Queen Palm to Pink Cedar to Southern Magnolia, each street has its own designated variety. 9. Print a Beverly Hills Walking Tour from LoveBeverlyHills.com or pick one up at the Beverly Hills Visitor Center and then explore the city on foot. 10. Window shop 'til you drop on Rodeo Drive. These three blocks of luxury shopping are the best in the world for day-dreaming and indulging. Content provided by the Beverly Hills Conference and Visitors Bureau. Click here for 40 more free things to do in Beverly Hills.